It doesn’t seem that long ago that we saw Erik Buell tearfully announce his departure from the Harley-Davidson enterprise, but, as they say, things happen for a reason. Buell and his new American company Erik Buell Racing (EBR) are already accelerating rapidly toward racing at the highest level (in WSB this year) and distributing its own motorcycles, as well as Hero models, through its new U.S. dealer network. The collaboration between Hero and (Erik Buell Racing) EBR stood out loud and clear at the Hero pavilion with the EBR 1190RS and the brand new 1190RX sport bikes being displayed on marquee pedestals. A slew of products developed jointly by the engineers of Hero and EBR generated massive interest from media and drew huge crowds to the Hero pavilion. The presence of Team Hero racers Geoff May and Aaron Yates added to the excitement. Hero also unveiled a trio of scooters developed jointly by its partner Engines Engineering of Bologna, Italy. Hero MotoCorp’s Managing Director and CEO Pawan Munjal addressed the media through a series of press conferences, starting from January 29, profoundly setting the tone to make it Hero’s show at the Expo. Featuring a slim and agile seating position, high-tech engine and world class sport chassis, the Hero HX250R has all the attributes to deliver the perfect lightweight sports bike experience. With its high performance liquid-cooled balanced engine and advanced multi-sensor electronic fuelling, the HX250R can deliver best-in-class performance, while also being refined and fuel-efficient around town. This new motorcycle comes packaged to delight every passionate sporting rider. Aerodynamic styling, six-speed transmission and lightweight mass-centralized chassis make the HX250R incredibly responsive in all riding conditions. The geodesic tubular chassis integrates the engine as a stressed member, and allows full control of its modern 17” sports bike wheels and tires. The entire package results in spectacularly good handling and stability for riders of every skill level. When it’s time to stop the riding fun, the linked brake system features powerful Brembo design hydraulic calipers gripping the 300 mm front and 220 mm rear brake rotors. For discerning riders, the HX250R also offers an option with the latest ABS technology. RNT is the proof that handsome and hard-working really can go together. Many motorcyclists need capacity and power to haul heavier loads, but they also want to be comfortable, fuel-efficient and stylish. These requirements are addressed with the striking new RNT concept. The RNT’s wide flat loading surfaces with strap bars, as well as multi-use folding side racks, a large comfortable seat and spacious footboards, create a new look never seen on a motorcycle before. Under the surface, too, everything is new, exciting and practical. Power comes from a high torque 150cc diesel with an optional turbocharger, so even when fully loaded, the RNT can master all roads. The RNT also has options galore, including an accessory oversize generator, which along with the diesel engine delivers extra electrical power for work (or play) at a remote site. The optional removable LED lamp in front of the dash can be unclipped and re-aimed so the work or play can carry on into the night. Another option on the RNT concept is a hub electric motor in the front wheel, which is powered by an electric battery pack. This gives riders a unique two-wheel drive option for the toughest world conditions, as well as the possibility to shut off the rear drive and move through the city on electric power front-wheel-drive only. Along with this unique design, even more optional accessories will be available. The Hero RNT shows there’s a whole new future, delivering real utility and fun in a handsome and efficient package. Leap, the first electric-serial-hybrid scooter from India, returned to Auto Expo in its pre-production form. It has been designed with Hero’s global markets in mind. When the Hero Leap first appeared as a prototype at the 2012 Auto Expo, it seemed to be a vehicle from the distant future. This year’s preproduction model shows Hero is well along the path of putting the future into riders’ hands. Powered by lithium-ion batteries and an 8kW electric traction motor, the Leap eliminates the limited range of an electric vehicle by incorporating a “range extender,” an on-board generator set powered by an extremely efficient new 124cc engine. Normally, the Leap would be recharged by plugging into a wall outlet. If that isn’t available, however, the 3-liter fuel tank and the range extender of the Leap give it four times the range of batteries alone, and the fuel can be quickly refilled. With its sleek aerodynamic styling and all-LED lighting system, the Leap makes a strong statement of Hero’s technical innovation, and how the company is looking toward a greener future. The permanent magnet AC (PMAC) traction motor that powers the Leap produces maximum torque of more than 60 N-m from a standstill, so this advanced scooter requires neither a clutch nor a transmission. Final drive is a high-technology toothed belt housed cleanly in the swing-arm, designed to last the life of the vehicle. Top speed of the Leap is 100 kph (62 mph) when running with the range extender. Its near-silent acceleration in full electric operation is better than that of many gasoline scooters. For braking, the Leap smoothly and quickly slows and stops with its powerful Brembo two-piston front 240 mm disc brake. The 620cc Hastur promises to shake-up the middleweight motorcycle segment with its lean, nimble and powerful appeal. The Hastur comes with a water-cooled parallel twin engine that delivers 80 hp at 9600 rpm. This explosive power delivery comes from a new and very compact powerplant that serves as a stressed member of the chassis for optimum mass centralization to give best-in-class handling and maneuverability. The unique design features a counter-rotating crankshaft for incredible nimbleness, cartridge transmission with auto-style power transfer to give best fuel economy, and an advanced cylinder head and combustion chamber design for reduced emissions. The Hastur makes an aggressive style statement with its streetfighter looks and the minimalistic bodywork reveals performance essentials such as big sticky tires, performance suspension and brakes, geodesic tubular chassis and a powerful engine. With all this and much more, the Hero Hastur is ready to respond to the athletic rider’s every desire like nothing ever ridden before. The Hero ion offers an exciting glimpse into the future and demonstrates Hero’s beliefs and commitment to the endless road of motorcycling and personal transport. All electronic, ion has Lithium-air batteries and hydrogen fuel cell range extender packaged in the center structure with super capacitors to meet energy needs for acceleration and braking. The Lithium-air battery, which is the lightest and highest energy density battery, uses oxygen from the air instead of storing an oxidizer internally. Airy, open wheels contain the rotor component of hubless electric traction motors that uses magnetic levitation technology that works with zero friction. When needed, the traction motors also function as brakes. The vehicle is controlled by light finger touches controls built in the handle grips. Commands from the fingertips are sent to VCM (Vehicle Control Module) where they are converted to drive signals for PBS (power, braking and steering) systems. A Ride-by-Wire feature integrates multiple on-board electronic traffic sensors for collision detection and avoidance. Variable two-wheel steering works in synergy with the rider’s driving style and vehicle dynamics to optimize handling. A Vehicle Situational Awareness (VSA) system keeps track of the surrounding traffic flow and make corrections to the PBS system as needed. The VSA system overrides any lower priority communications when traffic density becomes significant. M-Link is an advanced suspension linkage technology that provides incredible control of the road and an exhilarating driving experience. It features electronic force mapping through sensors that manage all suspension components. These sensors continuously vary the power of the electromagnet that controls the damping characteristics of the suspension in real time. It seamlessly integrates with other vehicle systems including the Ride-by-Wire steering to provide user-profiled ride characteristics with road vision-controlled damping. Core vehicle information is available in the compact instrument cluster, but full information and communication is transmitted to the rider’s helmet. The VSA system overrides any lower priority communications when traffic density becomes significant. The Hero ion welcomes riders to a whole new green motorcycling experience. SimplEcity, the lightweight urban electric motorcycle from India, reiterates Hero MotoCorp’s steadfast commitment to efficient, reliable personal transportation for a free and green planet. The revolutionary SimplEcity promises to offer an efficient and reliable intra-city travel experience to the urban commuters. By keeping weight to a minimum of 35 kg (77 lb.) and designing every system for optimum performance in city conditions, Hero has created a whole new segment of motorcycle for a cleaner and greener planet. The SimplEcity comes with innovative features such a removable battery pack for the convenience of recharging. Another innovation is the dashboard that is delivered through the rider’s smart phone using a free SimplEcity application. This can be achieved by conveniently mounting the phone on the handlebars. The “walk’ mode let rider roll it effortlessly when walking or gives it a needed push if taken upstairs. Having an irresistible blend of vintage and young styling, Hero MotoCorp’s flagship brand comes in a new version as the 100-cc Splendor Pro Classic. It offers a distinct riding experience with its cafe racer styling, including the new handle bar, classic round headlight and tail light, cafe racer cowl and added chrome parts such as the front and rear fenders, turn signals, suspension cover and round rear-view mirrors. The impeccably-styled Splendor Classic is powered by a 100cc air-cooled, 4-stroke single cylinder overhead cam engine, producing maximum torque of 8.04 Nm at 4500 rpm. The new 100-cc Passion Pro TR offers an adventurous ride to young bikers with its ability to take them off conventional roads. The Passion Pro TR offers exciting off-pavement ride capabilities with a host of new external features that includes on-off tires, sturdier handlebars with cross brace, high front fender, hugger front fender, headlight grill, hand guards for added protection, bash plate and fuel tank pads. New colors and graphics add extra punch to the styling. Headquartered in East Troy, Wis., Erik Buell Racing engineers, develops and manufactures high performance motorcycles for sport bike enthusiasts around the world. Additionally, EBR Engineering Services provides engineering consulting expertise for projects inside and outside the motorcycle industry for a global client base. 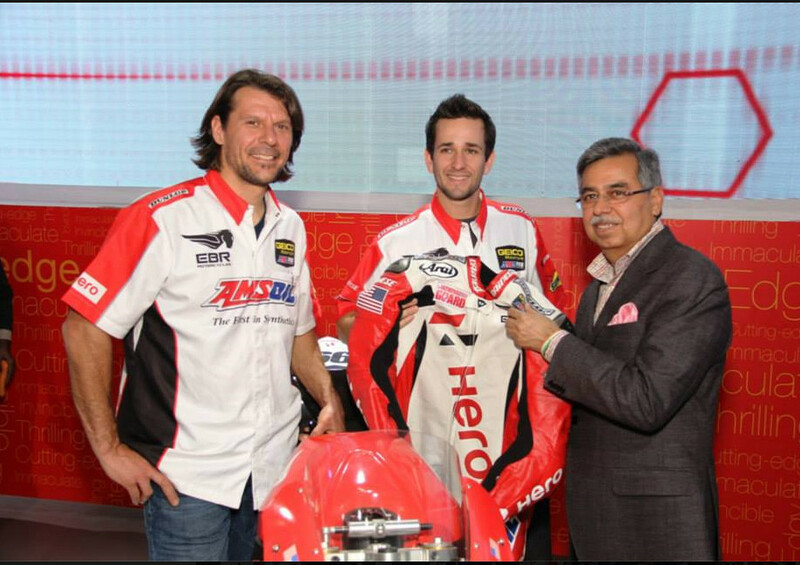 Based in India, Hero MotoCorp Ltd. is the world’s largest manufacturer of two-wheelers. In 2001, the Company achieved the coveted position of being the largest two-wheeler manufacturing company in India and also the world’s leading two-wheeler company in terms of unit volume sales in a calendar year. Hero MotoCorp Ltd. continues to maintain this position. Aaron and Geoff – Just keep ’em upright boys and have a good time with them thar WSBK fellas. I’ll be sittin on my Buell and cheerin’ ya on in that thar first race. Do us proud – we know ya will!!!! Helmets off to you Erik! Sure feels good to be a Buell guy. It’s amazing that all this enthusiasm and innovation can’t (didn’t) come from our homegrown, higher learning trained, Wall Street driven, CEOs and it has to come from a socalled third world country. I’ve always been Eriks biggest fan and he seems to be working for/with some of his fans/admirers. Homologation, wow that’s a big word. Can you say that in Kalifornia? Not only can we say homologation in California, we can lane split legally. Does that mean this year? What color? Wow. Erik trying to succeed on merit and hard work. Harley trying to succeed on the coat tails of a fictional MC. Hope Erik makes it, he deserves it, although it’s going to be rough at the back of the pack. Now, BRING OUT THE NEW ADVENTURE BIKE! +1 for a new Sport Touring bike…. S4T anyone? The headline was a bit, ah, misleading. The scribe in charge should have written “and new Hero models”. For a minute, I thought Polaris had a snowmobile plant in India. I can’t receive WSB any longer in my part of the U.S. (Dakota), Has DORNA dumbed down this series to a supersport spec yet? It is amazing to read about all the innovation in the works at Hero. Of course it’s nothing like the kind of innovation we have in the Good ol’ USA from the likes of Harley and Victory. I am really happy for Erik. He went from being laughed at by a parent company that thinks it’s more important than it really is to being appreciated and respected at the world’s largest motorcycle company. Amazing! Loving all of this Buell press recently. Twenty some years ago my next door neighbor owned an old Korean Hyndai, which constantly broke and he nick named “the bomb.” Hyundai now makes among the highest rated vehicles extant, and are generally extremely reliable. Apparently Korean Hero/EBR’s very first Superbike competes directly with the world’s best motorcycles. Good on Eric! Hope they rip up the WSBK circuits! Korean? You mean Indian, right? Congrats to both Aaron & Geoff for a new road racing career/adventure in WSBK ! I’ll be watching you guys and wish you the BEST ! Ditto, Good luck guys and give ’em hell. Aaron no drop kicking other racers please. Ha! ummn Geoff, Aaron, don’t you guys have some place to be…? Wow, it is really shocking read a press release talking about actual innovation instead of more of the same crap. I do hope the styling improves. I doubt it will all happen but I hope they pull most of it off. Hats off to Hero/ EBR. EBR is doing some innovating in WSBK. They are using the radical tactic of making superbike slower than a 600. Oh cut them some slack… First time both riders have been to either track and its the first time the bike has been there too.. Personally I think EBR should have stayed in AMA a Little Longer..While at the same time.. Picking up a few more aggressive drivers..
Wow. The War and Peace of press releases.